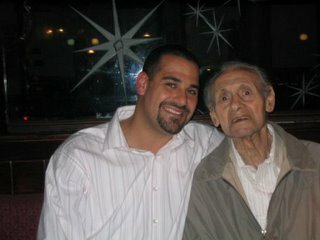 My grandfather passed away on Monday (February 20th), so yesterday I said good-bye to him for the final time. As sad as death itself is, I don’t feel completely sorrow today. I know this probably doesn’t sound right – but let me try to explain. He was married for 64 years to my grandmother! My sister and I are convinced that Seinfeld and Larry David ran into my grandparents somewhere in Sunrise Lakes Phase 3, and then modeled Frank and Estelle Costanza (George’s parents’) after them on the hit show. He was a somewhat quiet man (especially on the phone), well, until he felt comfortable. Feeling comfortable was either being with his family or having 2 glasses of scotch. After which, he was certainly no longer shy…. Although I called him “grandpa” it was clear that he really just wanted to be our “pal.” He was a fun dude – there’s just no other way to phrase it. In his spare time, he loved to bowl, play pool, and go to the race track. As my grandmother puts it, he also enjoyed “speaking in Jewish” (yiddush) to anyone who would listen. He certainly enjoyed his whiskey and his food. Foods that come to mind are sausage, herring, and pickles. (Strangely enough, I don’t remember him eating my grandmothers chopped liver – which believe it or not was my (and my sisters) favorite. 1) He rarely asked general questions like “How are you?” He would ask things like “Are you happy?” …I think I’d like to try and take that with me down the road. Obviously there needs to be a comfort level with someone before asking questions like that – but I do admire the fact of boiling down a question to what you want to know. To him – happiness was all that mattered. Not money or material things, not popularity or anything else. As simple as it sounds – he really just always wanted me to be happy with my life -- regardless of any of the details – and I would like to take that with me. 2) The man never seemed to worry. I can’t say he was 100% stress-free (mostly in thanks to my grandmother), but he always seemed to just take things as they came. So, congrats on a great life Grandpa! You will certainly be missed most by your wife (Grandma Crannie), but Roz, Ron, Bruce, Ellen, Lauren, Jill, Fred, Amy and I will all miss you very much and will think about you often. I especially will have you in my thoughts when I go bowling or go to the racetrack. My condolences. This was a very nice post. Your perceptive and realistic understanding of your Grandpa is very touching to me. He was so proud of you, almost as much as I am. I love you.